The book starts out by describing the case of Charles Monet in western Kenya who was infected with the Marburg virus, and the horrifying and hard-to-believe effects of the virus on Monet. 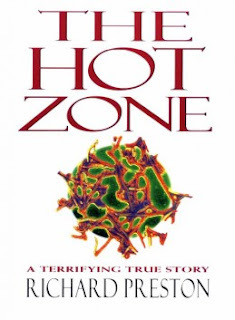 Some pages later, the book moves to the US, where the "decon" mission - to decontaminate the facility of the virus took place, "... the first major bio-hazard mission the world ever knew... ", is described as it happened over the course of several days. From the identification of the virus, the coordination and the political tensions between the US Army and the CDC, to the mobilization of the troops and materials, to the actual operation - are all described in detail. Sometimes, however, the description reads a bit like a screenplay. Which in itself is not bad, except that it does tend to distract your attention, away from the plot. The end is almost reassuringly calm, and almost makes you feel that the world is safe again. But it is not, as the author points out. The fact that the Ebola Reston strain has infected people and yet not made them sick is only the result of a possibly beneficial mutation of the virus. If it were to mutate in some other malevolent way, the consequences could be devastating for the world human population. Given the speed with which diseases can be spread from one corner to the world to the other, one has to assume it is only a matter of time before some as-yet unknown mass-killer pathogen makes it appearance. The author does speculate that humans may, unsurprisingly, be to partly blame for the emergence of these mass-killers. The first part is by far the scariest, and written with a cold and terrifying eye for the gruesome detail.